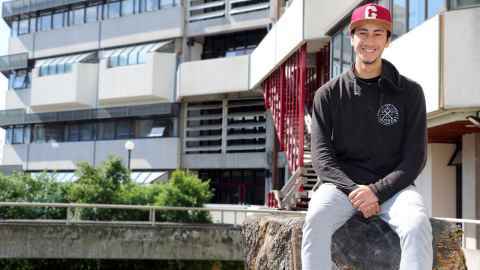 Third-year Dance Studies student Villa Lemanu says enrolling in the Bachelor of Dance Studies is the best decision he’s ever made. "I’ve always had a passion for dance, but I wasn’t sure I wanted to pursue it. When I came for the audition, it was very relaxed, not as stressful as I thought it would be. I thought I was going to be surrounded by ballet dancers who had been practicing for years, but all of us are in the same place, experimenting and learning together. "Studying has opened my mind to different sorts of dance and the possible career options. I enjoy the theory side of the degree. I didn’t think that it would help with how I move, but it’s really shaping me as a dancer, helping understand how I dance and how others do as well. "I have had so many opportunities this year. I have performed in Short+Sweet and Tempo festivals in pieces choreographed by postgraduate students, which introduced me to people I know I will work with in the future. I’m part of the CAI Tuākana group and I’m also doing a music paper for my General Education, which has complimented my dance degree quite well. "I would recommend coming along and having a look at University life for yourself. Come to open days and performances, get a feel of what Dance Studies has to offer. I really love it here, it was the best decision I could’ve made."